The 2017 Honda Ridgeline has arrived here at Cannon Honda! Like the first-generation Honda Ridgeline, this is no ordinary pickup truck. With its agile handling, spacious cabin and uniquely convenient features, the 2017 Honda Ridgeline is one of a kind. How do its features and capabilities actually stack up against its predecessor? Take a side-by-side look at the 2017 Honda Ridgeline vs 2014 Honda Ridgeline, and you'll see some important differences right away. The 2017 Honda Ridgeline keeps two of the 2014 Honda Ridgeline's signature features. Both models come with a unique dual-action tailgate, which can swing out either sideways or down for easier loading and unloading. Both models also come with a secure in-bed trunk for extra storage. However, the 2017 Honda Ridgeline shows off a few design improvements. The new in-bed trunk has a flatter floor, and it comes with a removable drain plug for easy cleaning. The 2017 Honda Ridgeline also adds several more unique features to the truck bed. It's available with an AC outlet in the bed. Most exciting of all, it's available with the first in-bed audio system, which can basically turn the whole truck bed into one big speaker system. The 2017 Honda Ridgeline is available with a new Apple CarPlay / Android Auto-compatible audio system, which simply wasn't available yet in 2014. The same goes for the available Honda Sensing driver assistance tech. This is a new generation of Ridgeline, for a new generation of driver. 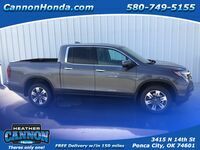 Interested in learning more about the 2017 Honda Ridgeline in Ponca City, OK? We're happy to help! Contact us online, call (580) 749-5155 or stop by Heather Cannon Honda to test drive the brand new Honda Ridgeline today!